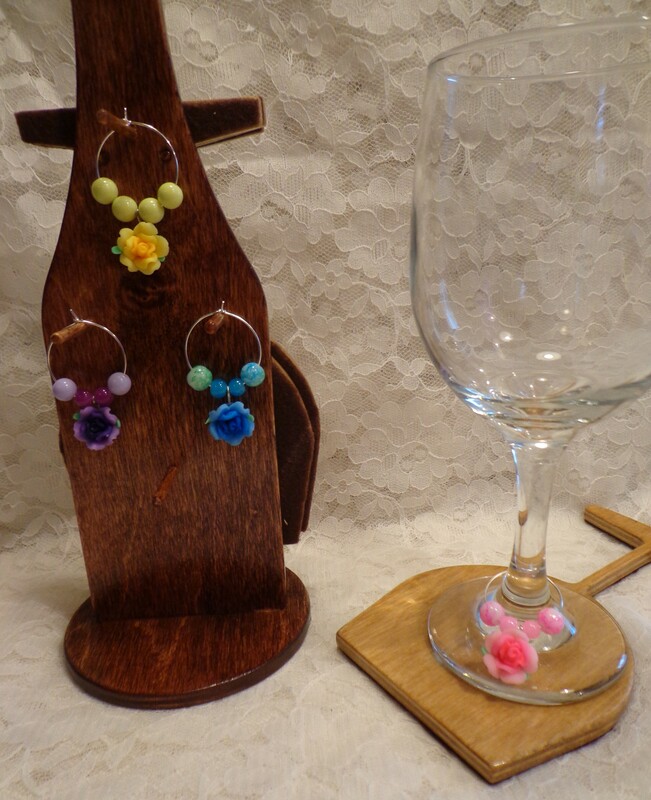 Do you remember the Wine Glass Coaster set that I showed you earlier this spring? 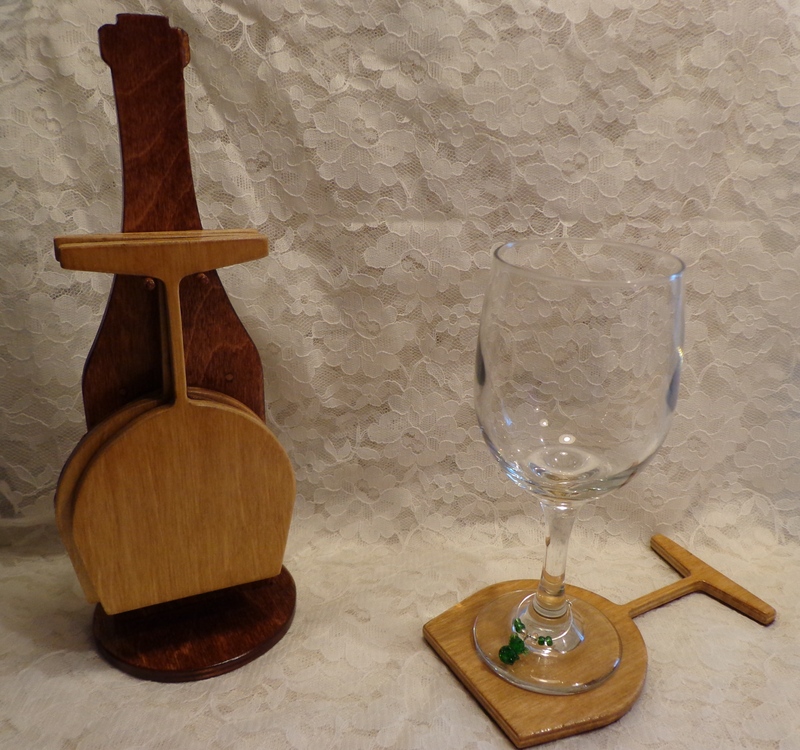 The first round I did a light shade of stain for the bottle and darker stains for the wine glass coasters. Our church has a summer festival and the choir decided that we were going to put together a wine-themed basket for the Chinese auction. My contribution was one of our wine glass coaster sets. For this set I decided to flip it around. I went with a darker bottle and lighter coasters. Also, can you tell that I’m trying to get better at taking pictures of our stuff? I’ve done some reading on photography boxes and I have to get friendly with Photoshop. This picture isn’t the best, but it was my first attempt. 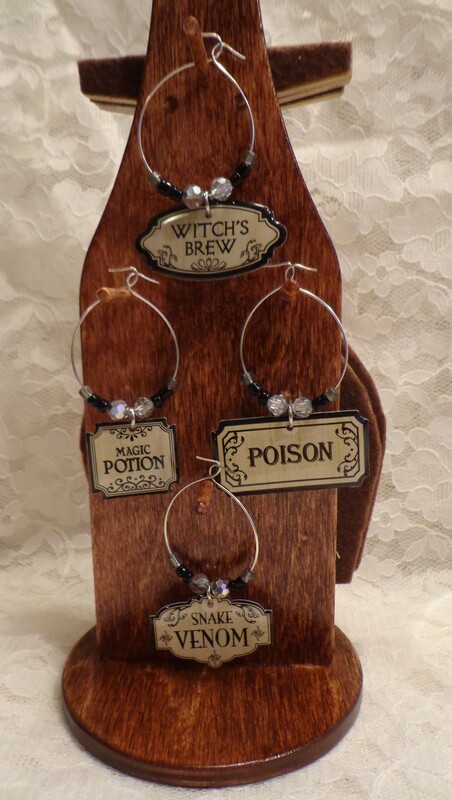 My favorite thing about this latest round of coasters, though, are the new charms that I made. I’m not good at beading and I really have no desire to make jewelry. 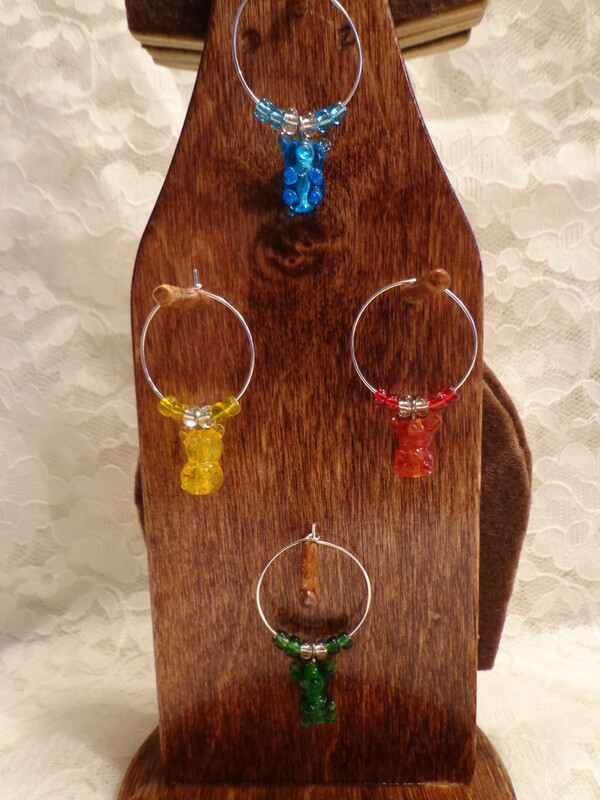 That’s why I have a mother; so that she can do the jewelry thing and make me whatever earrings I want. I know that the picture doesn’t show off the bears very well (again, I need practice), but in person these are the most DARLING things! These were glass lampwork beads that I found and instantly knew that I had to use them for my wine charms. Luckily I already had glass beads that matched the colors almost exactly. This came as a set with the watering can, wheelbarrow, an all silver butterfly and a stupid silver tag that said ‘blossom’. Seriously? You’re going to do a garden-themed charm set and not even include an actual flower?? That just didn’t work for me. 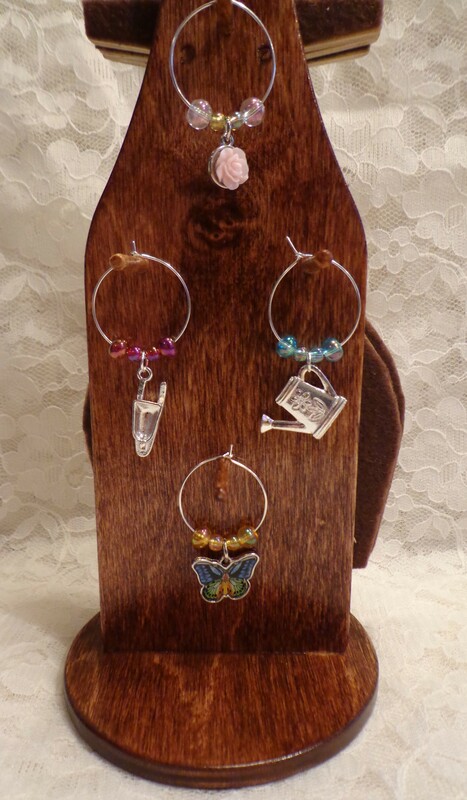 When I was trolling the bead area of one of the craft stores I came across these pretty butterfly charms. I grabbed those up (they were on clearance!) and then I found the little rose charm and knew I had to use that one. There was no way I was going to use a tag that said ‘blossom’. I think that these would go great around Halloween. I had inherited a large container of beading stuff and luckily in there was a selection of black, gray and smoky-colored glass beads that I think really go great with these tags. Okay, so these are another favorite of mine. I would be very hard-pressed to say which is my favorite: The Gummy Bears? The Roses? It’s a difficult decision! Also, let me just say that sales are a dangerous thing and especially beads that are on sale. It quickly adds up! I had purchased these pastel glass beads, but really didn’t have a plan for them. 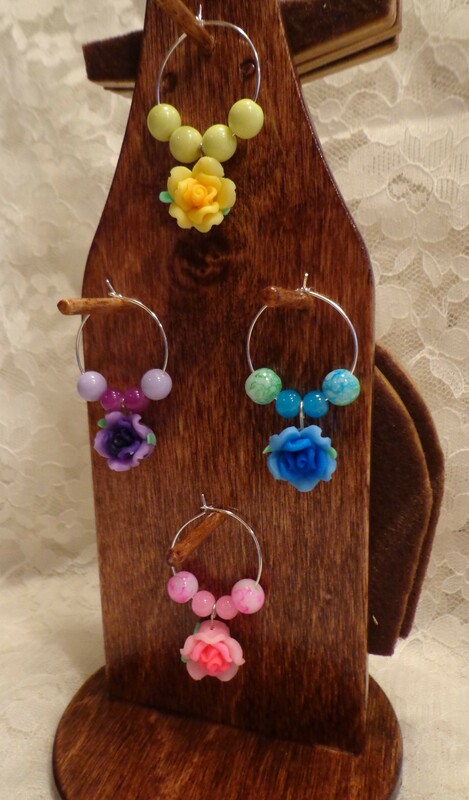 Then at the store I found these polymer clay rose beads and the light bulb went off. 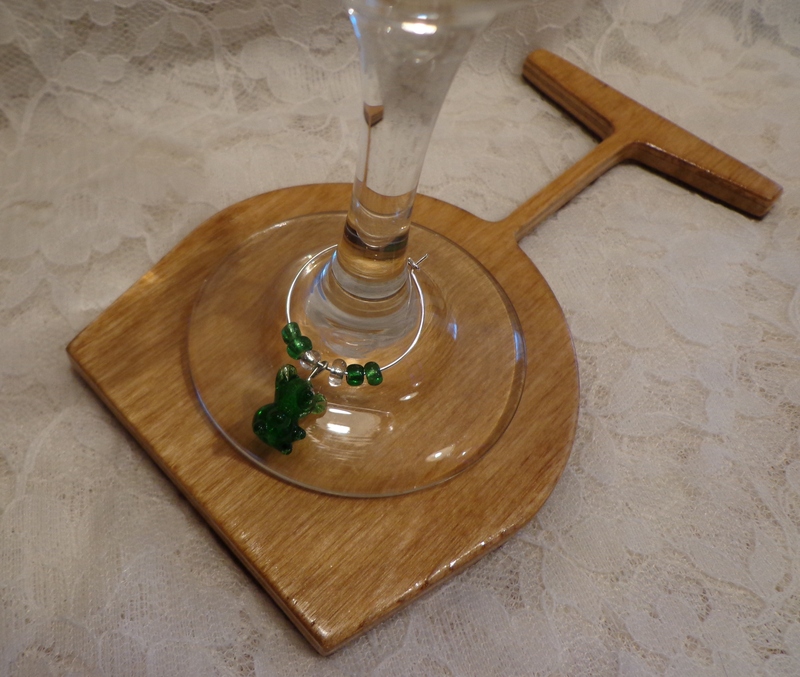 This entry was posted in CNC Router, Roses, Wine, Wood Work and tagged CNC Router, Wine, Wine Glass Charms. Bookmark the permalink.